self-storage facility that should be considered as you manage your storage requirements. Improved Organization: Using our self-storage location allows you to be more organized at home and at your business. When an item has a dedicated place to be stored, the item can easily be found and accessed when it is needed. Less Clutter: You can reduce congestion and clutter where you live and work by using our dedicated self-storage space that allows stored items to be located outside the path of your day to day activities. This will help you to look better and feel better around your home and work place. More Space: If the volume of your items exceeds your available space, more space is quickly and easily accessible with the use of our self-service storage facility, and there are many space size options to pick from so that you can choose a size that best suits your current needs. Our ceilings are even higher to generate more cubic feet of actual storage in every square foot of floor space. Added Convenience: Our facility location, layout, & design are all intended to support moving in and out quickly and conveniently, including drive-up access. Simplicity: Arranging and renting a self-storage space from us is quick and easy as we maintain an office nearby with staff who are ready and waiting. 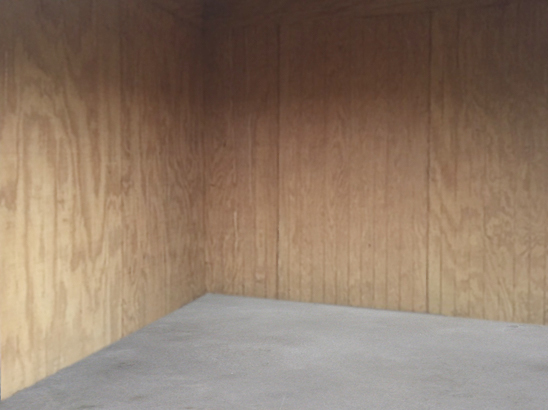 Access to our facility and loading & unloading is made to be simple as you use our self-storage unit. 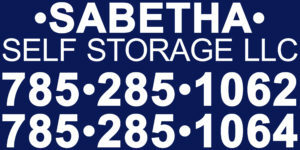 self-storage arrangement to meet your needs with the help of our professional staff. to all of the extra amenities that we provide. The ability to only rent what you need when you need it will save you money along with being a part of a cost saving group that houses their items in a common building divided into private individual spaces. attention that come with owning your own storage building. 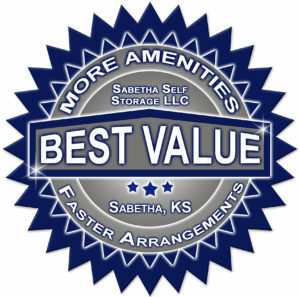 Sabetha Self Storage, LLC would like to earn your business as we focus on benefiting you more & being the absolute best storage value for you.